I love watching and listening to Parrotfish as they scrape algae from the skeltons of corals. 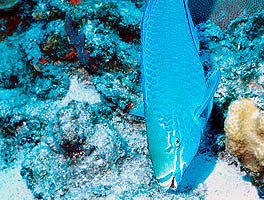 Check out this great picture of a Queen Parrotfish in action. Shangri-La is a busy reef near San Salvador. 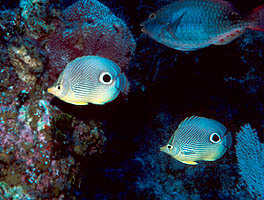 Click here to see a mated pair of 4-Eye Butterflyfish with a Redband Parrotfish nearby.